Being a vampire has to be fun. What vampiric quality would you like to have? RP: I think Edward is tired of being a vampire. The cons outweigh the advantages. You have extraordinary physical qualities but you can't do anything in your life. What good is having power if you can't use them and have to hide all the time? 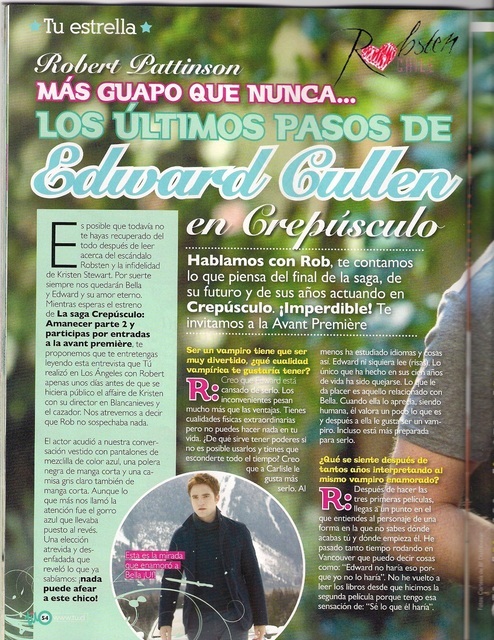 I think Carlisle liked it more, at least he studied languages ​​and stuff, Edward doesn't even read (Laughs). The only thing Edward does in a hundred years is complain. What gives him pleasure is anything related to Bella, when she approves of him while being human he begins to accept what he is. And then she wants to be like a vampire; even she is more prepared to be a vampire. What does it feels after so many years playing the same in-love vampire ? RP: After doing the first three films, you get to a point where you understand the character the way in which you don't know where you end and where he starts. I spent so much time filming in Vancouver that I can say things like: "Edward wouldn't do that because I wouldn't." I haven't read the books since we made the second movie because I have that sensation of: "this is what he would do". Edward choose a strong partner to accompany the rest of his life, do you like strong women? RP: I was raised in a house full of women, who are all very strong... if you only have sisters and you are the smallest you'll always end in minority. Now that is over. What are the little things you'll miss of the set of the Twilight Saga? RP: There's a place to eat, shawarmas in Vancouver. It's incredibly good, it's something I'm going to miss, and the worst thing is that I don't even know where it is because, there was always other people who brought the food (laughs). Also breaded chicken strips in Hotel Room services(laughs). Is it a relief for you that this has come to an end? RP: To be honest, the filming of the final two films was very hard and very long, I had two hours of make-up everyday and I had to do it for eight months. After a while it becomes heavy. But, it's going to be hard not to go to Vancouver every year. Do you get along with your co-stars? RP: During the first and second film we spent so much time together, but after the third was made it become more complicated because there were always fans outside the hotel and stuff. But this people are the ones that I know in America the longest and I always see them... except Taylor (Lautner) because he lives on the outskirts of Los Angeles, and I have to drive a half hour to get to his home. RP: Swearing is something I do compulsively. I don't even realize I'm doing it. But, I never paid Mackenzie (laughs). Have you kept any object from the movie? RP: Kristen kept the wedding ring, but no one gave me anything. My ring is sure going to end in one of those Planet Hollywood restaurants. Maybe it's already to buy it on eBay (laughs). RP: Twilight; despite being a massive success it still feels fairly alternative. There are not many things that are similar to it. Even the Hunger Games, which also has a girl protagonist, is not the same genre, despite having raised a lot of money on the opening weekend and are also a series of books for teens, is not the same as Twilight. RP: I began to see the movie a couple of days ago and I haven't finished, but it's great. No resemblance at all to what I thought it was. Not exactly what I expected but it certainly is different. It's interesting. 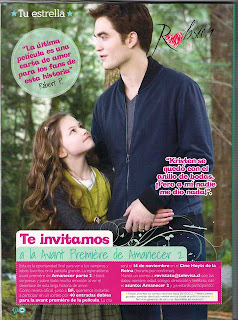 It's kind of fun that people promote it as the new Twilight, because it does not come close to what it is. Five years back in time would you have liked to know something about how your life was going to be after Twilight? RP: I was 21 when it all started and I was part of a group of friends that I still keep. They knew what I wanted to be. Making movies is fun, there is nothing in it that is difficult, their surroundings is what is crazy. There are multitudes in every projection and stuff, but you have to do see the fun part of all. Do you like to read what the press writes about you? RP: Yeah, but sometimes I look like a fool in this invent things. Some time ago I read in a magazine that I was getting married to Kristen. This explained how I had proposed marriage. Apparently I took her to a beach and we were both in flowing robes and I played a song on my guitar. I hope that if I had proposed to her like that she told me no (laughs). It's shameful, not only because they invented something but because it also made me look like the biggest idiot in the world (laughs). Why can they not invent that I proposed in a spaceship or something more fun? What human quality you appreciate more after playing a vampire for so long? RP: I kinow that there is only an amount of time for doing things, I don't like the idea of ​​infinity. I have to have a reason to get up in the mornings. Maybe it's a little depressing to think about it that way but that's what I think. Curious answer to ending our interview; considering Kristen told us almost the same thing when we made this question a while ago. i cant wait for part 2!! !